For someone with a long-term medical condition, comprehensive home care is essential for maintaining quality of life. But caring for a loved one with special medical needs goes beyond the four walls of your home. Patients with mobility issues and other concerns must sometimes travel to see doctors, attend therapy sessions outside the home, or partake in social outings. Patient transportation often requires special accommodations. For patients who rely on a wheelchair to get around, it’s much easier to travel using a van with a wheelchair lift than a regular car. After all, traveling by car means making at least four transfers between a travel wheelchair and the seat of a car—not to mention the transfers between the patient’s usual electric or ergonomic wheelchair and the travel wheelchair. With every transfer, the patient risks falling or other injury—and the caretaker must possess adequate strength to safely lift the patient out of one chair, support them during the transfer, and get them securely seated again. Not every family is equipped with specialized transportation such as a wheelchair lift van, and it’s not always practical to buy one. 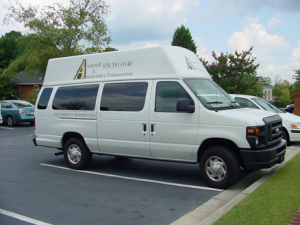 Fortunately, Assured & Associates can come to the aid of non-ambulatory patients in Marietta, Douglasville, Alpharetta, DeKalb County, and Atlanta with its fleet of wheelchair lift vans. Our staff of drivers and aides is specially trained to assist patients as they’re transported by wheelchair, and our around-the-clock service is available by appointment for non-emergency transportation needs. Assured & Associates can provide private transportation for patients who don’t require a wheelchair, but still need a little bit of help getting around. We’ll drive you or your loved one to medical or other appointments in one of our comfortable sedans or vans, arriving promptly and waiting to pick you up when your appointment is over. When you or a loved one have a chronic medical condition, most days tend to be spent at home. Something as simple as going shopping for groceries, clothes, or household items can be a bright spot in a patient’s day—and Assured & Associates can make this happen for clients in Alpharetta, Atlanta, DeKalb County, Douglasville, and Marietta. And since there’s more to life than medical appointments and running errands, Assured & Associates is there for patients when they want to go to the movies, attend a book club discussion, head to the bingo parlor, or enjoy other entertainment. We’ll help you or your loved one travel to experience life’s simple pleasures, providing the special equipment and staff support to transport patients with mobility considerations or other medical concerns. With Assured & Associates’ specialized transportation services, patients in northwest Georgia can travel safely and enjoy a wider world of experiences outside the home. Call us today at (678) 391-0140 to find out how Assured & Associates can make travel easier, safer, and more pleasant for you or a loved one.